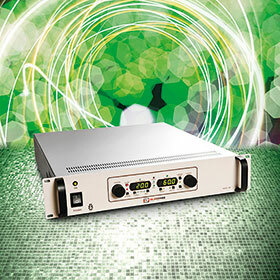 XP Power has introduced a series of rack-mount, high-voltage DC power supplies able to supply up to 60 kV. Aimed at laboratories and OEMs, the EY series of 1200 W power supplies feature flexible embedded controls with low ripple and noise. They are air insulated, fast-response units with tight regulation and extremely low arc discharge currents. For use in the medical, industrial and general high-voltage areas, the most important applications for the units are in vapour deposition, ion implantation, glow discharge, electrostatics, plasma sources, cyclotrons, X-ray and other vacuum tubes. The EY series comprises of 16 models from 0 – 1 kV to 0 – 60 kV at 1200 W output power. Typically, ripple is less than 0,02% RMS of rated voltage at full load, and off-line pulse-width modulation provides high efficiency and a reduced parts count for improved reliability. The first four models in the range feature reversible polarity, and the others can be purchased as positive or negative polarity units. The power supplies feature automatic crossover from constant-voltage to constant-current regulation, providing protection against overloads, arcs and short circuits. Their arc quench feature ensures that the HV output is inhibited for a short period after each load arc to help extinguish the arc, while their remote analog and digital control via RS-232 and USB offers flexibility of integration. Similarly, optional Ethernet control provides the possibility of control and monitoring from remote locations. The EY series’ bench/2U rack-mount format makes them suitable for location on a test bench or for integrating with other equipment in a standard 19-inch rack. Featuring embedded microcontroller control, front panel digital encoders on the units provide high-resolution local adjustment of voltage and current program. The power supplies can operate from single-phase AC supplies of 180 to 264 V, are fully RoHS and CE compliant, and come with a 3-year warranty. As the world becomes increasingly smart and connected, batteries are not always the right choice in some of the emerging use cases.